Losing your starting pitcher two outs into a playoff game is supposed to be a nightmare for any manager, but all it meant for Terry Francona last night was that he got to put the game into the hands of a bullpen that has yet to fail him. Terry Francona has demonstrated that he has no use for conventional wisdom during this playoff run. 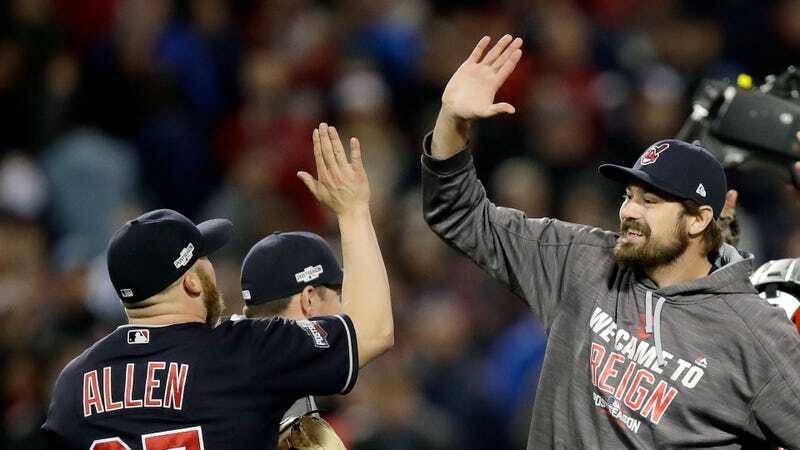 After the remains of Trevor Bauer’s pinky finger were mopped off the mound, Francona gave the ball to Dan Otero, a lights-out reliever who had pitched more than two innings just once this season. With men on first and second, Otero got a groundout to escape the first inning, and then induced a double play to get out of the second inning after surrendering a solo homer and a single. Otero was done after 1.1 innings, at which point Francona turned to Jeff Manship and Zach McAllister for a combined 2.1 innings that bridged the gap to the troika of Bryan Shaw, Cody Allen, and Andrew Miller. Those three divided up the last 14 outs and delivered the Indians a 3-0 series lead. Are you noticing a theme here? This is what it looks like when a manager understands that his bullpen is a weapon and not a backup plan. Otero had entered a game before the fifth inning just twice all season, but Francona understood that the bottom of the first with two outs and two men on is exactly the high-leverage situation that calls for the guy with a 1.53 ERA and a heavy sinker, rather than some junkballer who’s there to spend the next two or three innings trying not to let the game get out of hand. As impressive as Francona’s handling of his bullpen has been, it’s also been downright fun to watch. This team is the answer to every baseball fan who has ever gotten a little bit stoned and asked, “Wait, what if, like, you just had a whole pitching staff made up of closers?? ?” Francona has taken what’s long been a dream of sabermetrically inclined baseball fans and made it a reality. He has a bullpen full of destroyers who are not assigned to any particular inning and whose only job description is “strike everyone the hell out.” This bullpen might just win the Indians a World Series title, and revolutionize how baseball games are managed along the way.